This is my entry for this week’s critics blogathon on Milos Forman’s Amadeus.You can read about the project by the blogathon's leader, Vulture critic Bilge Ebiri. As the Oscars approach, it was decided by us that Amadeus is one of the great films that deserved the critical praise the film received, as well as its eight Academy Awards. At the end of this blog, you’ll find links to the other pieces in the series. There is certainly something sublime about the music of Mozart, even if we can’t understand why it arouses such feelings. Even those of us who have taken a music class at college perhaps don’t truly understand the genius that has made Mozart better known than any other composer in the world. But what if we could understand it from the mind of a great composer? And what if that understanding could be translated cinematically? That’s part of the conceit that makes Amadeus, the 1984 Oscar winner from playwright Peter Shaffer and director Milos Forman, a fascinating film, and perhaps one of the best examples in how directors can use music in film. 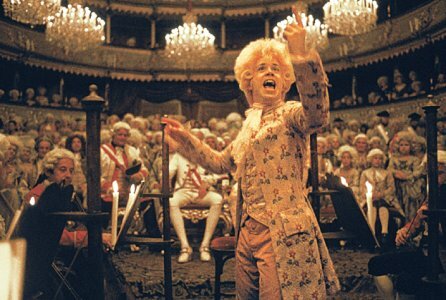 It would have certainly been easy enough for Forman to simply populate the soundtrack of Amadeus­—a quasi-biopic of Mozart as told through the eyes of a jealous rival named Salieri—with the music of Mozart without much thought in why they chose any particularly piece except the emotions felt. However, Shaffer and Forman use the music as specifically a subjective experience and commentary by Salieri. 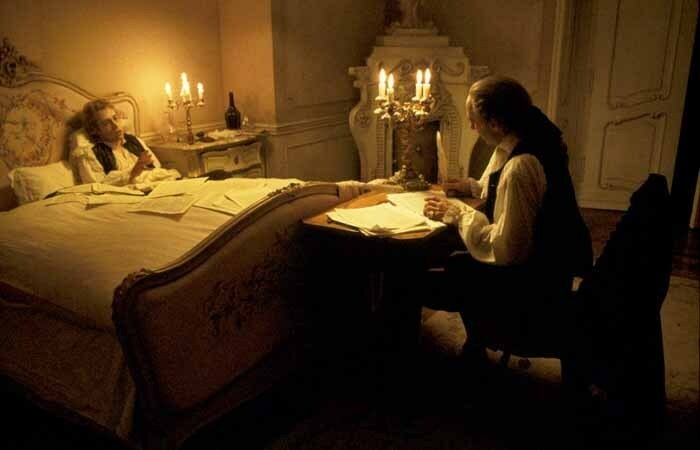 The music cues, both diegetic music (where the spectator can see where the source of the music is originating) and non-diegetic (music that overlay the soundtrack), offer insight both into how the spectator can understand the genius of Mozart and how the film uses Salieri’s knowledge of Mozart to comment and create a narrative of a man haunted by another. Forman and Shaffer set up our relationship to Salieri and music through the prologue to the film during the framing device, as Salieri tests the priest (essentially a surrogate audience). When playing an excerpt from one of his operas, Salieri lifts his fingers from the piano and begins to conduct. Here, the music shifts from the simple piano that is playing diegetically to a non-diegetic version, now giving the full breadth of the orchestra and singers. Forman then cuts to us watching Salieri perform in a flashback, the audience cheering near the end, and bringing us back to the older Salieri, the applause still filling the soundtrack while the priest looks on confused. This little test sets up how the spectator should understand how the musical cues in the film should be read; they are part of the imaginary landscape of Salieri. Thus, we must view any use of music not as a comment by the writer and director, but their comment on how their interpretation of the protagonist sees Mozart. This technique carries on into the narrative proper, most notably in how Forman and Shaffer present sight-reading. The film introduces the act of seeing music as hearing music when Salieri first discovers the sheet music for Mozart’s Mozart “Serenade No 10﻿ In B Flat Major K 361 III Adagio.” It’s a unique moment, because we have already heard the piece performed and conducted by Mozart. But we have only heard it in the way that we are used to hearing it—we hear the beauty but don’t understand it. 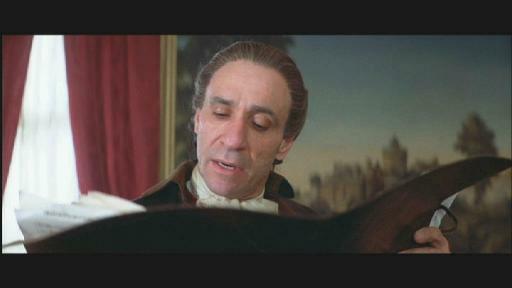 Two scenes later, Salieri walks upon the sheet music and Forman cuts to a shot of the sheet music. Then, Salieri begins his voiceover, as we cut to old Salieri describing it to the priest. We begin to hear the serenade again, now non-diegetically instead of with the orchestra we heard playing it before. But with Salieri’s description, we don’t just hear Mozart’s music. We hear the bassoons pounding along “like an old squeezebox” and understand the beauty of the oboe coming “down from high above.” We cut back to now a shot looking toward young Salieri looking on the music, his face filled with ecstasy and his hand silently conducting it. But as soon as Mozart unexpectedly grabs the music from the stand, Forman cuts the soundtrack as well. Salieri’s description of the music and the linking of shot of the music linking him, along with the non-diegetic music, put the spectator in the subjective perspective of this composer. This not only happens during the sequence described above, but later when Constance, Mozart’s naïve wife, brings originals of his music to Salieri. When he first stares at one of the sheets, a piece by the famous composer comes on that sounds like a choice by Forman to choose something that sounds like an epiphany. But when Salieri turns to a different sheet, the music changes as well. As Salieri flips from each page, Forman changes the music, putting us again in the direct subjective experience (Forman shies away from direct point of view shots, but the use of an over-the-shoulder creates a similar experience). However, one can extend the way Salieri imagines music into understanding how he is the crafter of Mozart’s and his narrative. 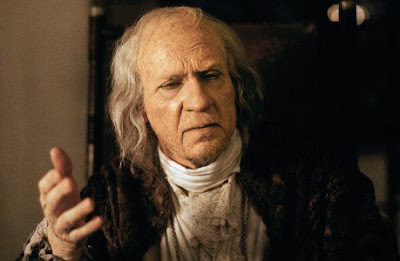 The music cues we hear throughout the film my be read less as non-diegetic music used by the director, but actually Salieri’s commentary on Mozart. The first of these is very simple: the use of the opening notes of Don Giovanni to mimic the film’s three-act structure. We hear these notes as the film begins, accompanying the screams of Saleri, crying out, “Mozart! Mozart!,” which sets the stage for Salieri’s desire to reveal his story. The two notes then return when Mozart’s father re-enters Mozart’s life, appearing in silhouette (later mimic the “ghost” of his father that demands the Requiem). This sequence appears soon after Salieri resolves to give up God and destroy Mozart, thus entering the “second act” in his story. We finally of course then hear it as the first two notes in variation during the premiere of Don Giovanni (the first note is heard non-diegetically as Forman cuts to a painting of the father before cutting to the opera, in which we hear the second note as part of the performance we see), The death of Mozart’s father becomes not only the impetus for Mozart’s downward spiral both professionally and personally in his life, but also gives Salieri the idea for the plan to kill him through music. Thus, Forman is able to make use of these two sustained notes as both a subjective foreground to how Mozart sees himself—Giovanni is the theme that haunts him, the father he cannot stand but needs for guidance—and also how Salieri is able to construct his narrative where the non-diegetic music is part of the beauty of how he crafts narrative. The last third, after Salieri (in a mask similar to one Mozart remembers his father wearing) commissions the Requiem Mass in D Minor. As Mozart slowly works on it, we hear the different sections of the Requiem play non-diegetically, even when he is not working. As we see his body begin to physically ail, Forman and Schaffer continually fill the non-diegetic space with the different sections of the Requiem. Forman and Shaffer seem to suggest through this use of music that it is less some mysterious disease is killing him than the process of writing death (as the Requiem is of course a Mass for the dead), or this is at least what Salieri wants to believe. Thus our two artists—the genius and the idiot, the storyteller and the subject—become linked by beyond the physical elements and through the cinematic elements of sound. It is no surprise that the final music heard as Salieri blesses the idiots is the Piano Concerto in D minor, K. 466; Kyrie from Requiem and sections of Don Giovanni are written in D minor. As the frame fades to black, we hear Mozart’s laugh once more in the darkness, impossible in terms of reality, but most believable cinematically. Salieri’s life has been consumed by the master, his music the soundtrack to his life, and non-diagetic sound the voices that haunt his guilt. -See all posts as collected by Bilge Ebiri on They Live By Night. -Matthew Wilder on the film's high art mind and audience-please spectacle, also on They Live By Night. 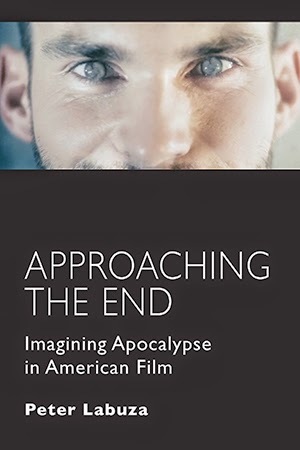 -Victor Morton on the film as a personal experience, and the film's religious aspects on Rightwing Film Geek. -The beloved Glenn Kenny provides some excellent thoughts on the film's very unique process from script to script to script to screen at Some Came Running. 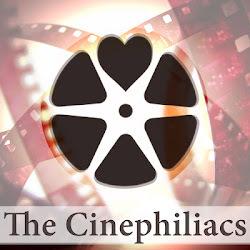 -Andrew Welch dives into the Requiem sequence over at Adventures in Cinema. -Tim Grierson on audience identification over at Everybody's Got One. -Zach Raltson on Salieri's relationship to Mozart and to his music at They Live By Night. -Victor Morton swings a second time at the film, looking strongly at Salieri's relationship to God. Again at Rightwing Film Geek. *The only other film I can think that did this would be my recent viewing of Béla Tarr’s Sátántangó, which has a number of characters reacting to the noise of church bells that we originally believe to simply be part of the soundtrack. One character late in the film remarks that these bells are coming from the heavens above. If anyone can name any others, please let me know in the comments, especially if they are Hollywood films (where experimentation is much less likely to happen). The scene where Constanze comes over to try and get him the job and the music changes as he flips the pages really made an impression on me when I was 11. I was home sick and watching this on VHS. I admit that maybe as it stands now Amadeus is not as excellent a film that I recall (I have actually never seen it projected) but it is the film that made me take notice of films in a way I had previously not and although it is overblown and almost paradoic I still love it. Like I said, I think it fairly gets away with all these elements because it's set in a subjective world. And interesting how you and at least two of the critics in this blogathon consider this a movie that made them love movies. Thanks for reading, Eve!